Zaneta Lucia Zorzi secretly reads science books while her mother pushes etiquette lessons. But on the eve of her sixteenth birthday, an arranged marriage changes everything. I’ve always been intrigued by arranged marriages. They were very common in the Renaissance, when marriage could make or break a family. Marriage was much too serious to leave up to young people—the institution was a business transaction designed to unite two families. And when Lorenzo de Medici married Roman Clarice Orsini in the mid-fifteenth century, it was seen as an insult to other Florentine families. Lorenzo’s choice declared that no one in Florence was worthy of an alliance with the Medici, so he was forced to go to Rome to find a bride. But marriage was not always an option. In the late sixteenth century, over 60% of Venetian patrician women were put in convents. Rising dowry costs and a closed patrician class created a crisis, where patrician fathers could not find suitable partners for their daughters. In this world, daughters had very few choices—in Italy, they would often be married or in a convent before their twentieth birthday. When I imagined the strict life of a Venetian patrician daughter, a character began to emerge: a girl who rejected those choices to pursue her true passion, the study of nature. 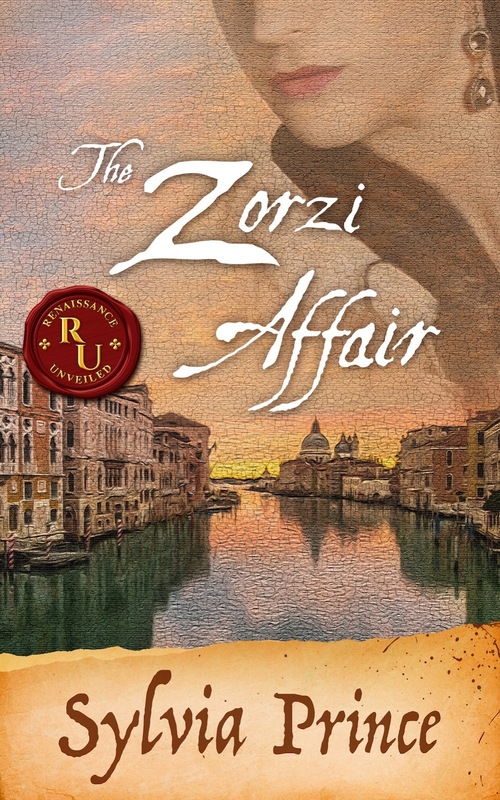 The Zorzi Affair follows Zaneta Lucia Zorzi as she flees her life in Venice to enroll at the University of Padua. Zaneta Lucia, disguised as a boy, moves in to Galileo’s boarding house—yes, that Galileo! 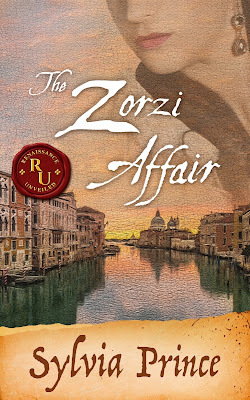 He actually did run a boarding house at the University of Padua, and my fictional Galileo, along with crafty tutor Paolo Serravalle, help Zaneta Lucia pursue her dream. I found myself rooting for Zaneta Lucia on her journey. And I loved writing about a woman pursuing an education at a time when women did not attend universities. The Zorzi Affair also allowed me to write about the history of science, which is a passion of mine. So if you’ve ever wondered about Galileo’s astronomical discoveries, but you’d also like to read about a courageous young woman, this is the book for you! Sylvia Prince is a historian and an author. Sylvia holds a PhD in history—and loves the bizarre but true stories she has encountered over the years working as a history professor. Did you know, for example, that in 1492 the pope received a blood transfusion by literally drinking the blood of three young boys? (It didn’t work—the pope and the boys all died.) 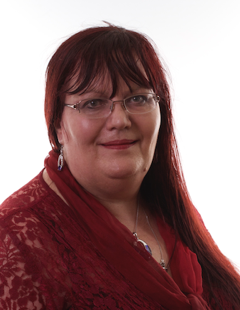 You can follow her on twitter @sprincebooks, find her on Facebook and visit her website, where she also blogs: www.sylviaprincebooks.com. "...O King...you sit a supper in winter, with your commanders and ministers, with a good fire in the midst, while the storms of rain and snow rage outside..."
Winter in the Dark Ages was a long, drawn out affair. There was no magic light switch you could flick on to banish the dark. Days were short. Nights were long. The world was in hibernation. Food was scarce, and it was cold. Winter was hard, and death from illness or starvation was a very real threat. It was no wonder that the pagans wanted to celebrate Midwinter and New Years Day. Interestingly, it wasn't until the 4th Century when Church leaders in Rome embraced this pagan holiday and made it their own. And over the centuries this pagan celebration has been 'added' to, until we have the Christmas that we know and love today. 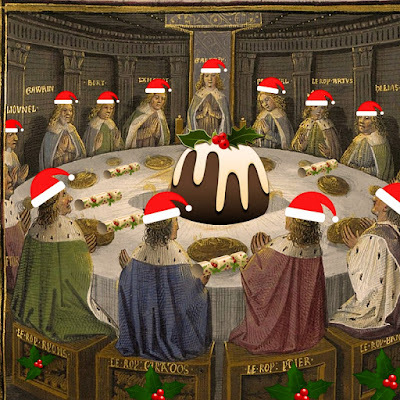 What was Christmas like in Arthurian Britain? Obviously, our Dark Age ancestors celebrated Midwinter and New Year, but when we are dealing with Arthur, we have to contend with a fictitious Christmas as well. In the 14th Century a poet, whose name has been lost over time, wrote an epic poem called Sir Gawain and the Green Knight. The Pearl Poet, as he became known, described Christmas at Camelot and, as with many things when we talk of Arthur, we can assume he used a great deal of poetic licence! Sir Gawain And The Green Knight. According to The Pearl Poet, Arthur knew how to throw a party! One would expect a feast at the Midwinter/ New Year celebrations, but perhaps not on such a grand scale. So what kind of food did the Dark Age Kings and Warlords serve up at a Midwinter Feast? Pottage — which was the staple diet for most, but at a feast it would have been the best pottage you ever tasted. The Rolls-Royse of Pottage! Roasted Goose and Partridge may have been on the menu. Eggs — preserved ones, because chickens tend to stop laying during the winter months. It is only how chickens are farmed nowadays that ensures we have fresh eggs throughout the year. The only fresh vegetables would have been seasonal, but back in the Dark Ages and the Middle Ages for that matter, it was not recommended to eat raw fruit and veg, for fear of dysentery – one of the biggest killers of the time. Of course, they would also have had ale, mead, wine and beer to wash it all down with! There may well have been one or two rosy faces by the end of the feast! There would have been music, and entertainment. Maybe not quite on the scale of the Beheading Game that The Pearl Poet introduced us to in Sir Gawain and the Green Knight, but I should imagine there were jugglers and those with what we would call Circus Skills! Bards would tell wonderful stories to entertain the guests — perhaps they told stories of Arthur and his Knights — and as the evening wore on, old men would become philosophical, as they contemplated mortality. It would have been a wonderful celebration that probably took many months in the planning. These Midwinter celebrations were so important. It was something to look forward too. And after Christmas and the New Year celebrations, spring was once again in sight and with so, the promise of life! Mary Anne Yarde grew up in the southwest of England, surrounded and influenced by centuries of history and mythology. Glastonbury—the fabled Isle of Avalon—was a mere fifteen-minute drive from her home, and tales of King Arthur and his knights were part of her childhood. At nineteen, she married her childhood sweetheart and began a bachelor of arts in history at Cardiff University, only to have her studies interrupted by the arrival of her first child. She would later return to higher education, studying equine science at Warwickshire College. Horses and history remain two of her major passions. Mary Anne Yarde keeps busy raising four children and helping run a successful family business. Find our more at her website and follow her on Twitter @maryanneyarde. As the struggle between York and Lancaster continues, Margaret Beaufort fights for admittance to the court of the victorious Edward IV of York and his unpopular queen, Elizabeth Woodville. The old king and his heir are dead, leaving only Margaret’s son, the exiled Henry Tudor, with a tenuous claim to the throne. The royal nursery is full, with two small princes securing York’s continuing rule. But Edward and Elizabeth’s magnificent court hides a dark secret, a deception that threatens the security of the English throne … and all who lust after it. In 1483, with the untimely death of the King, Margaret finds herself at the heart of chain of events that threaten the supremacy of York, and will change England forever. The Beaufort Woman: One woman’s selfless struggle for the rights of her son. Judith Arnopp is a historical fiction author based in Wales, UK. She has a particular interest the Tudor period and her collection of Tudor novels will take you inside the minds of women like Elizabeth of York, Anne Boleyn, Katheryn Parr, Anne of Cleves and Katherine Howard. 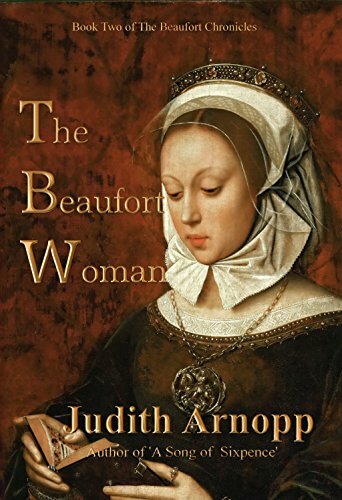 The Beaufort Chronicles, is a trilogy tracing the life of Margaret Beaufort, the mother of the Tudor Dynasty. Books one and two, The Beaufort Bride and The Beaufort Woman are available now and book three, The King's Mother is to follow soon. Find out more at Judith's website www.judithmarnopp.com/ and find her on Facebook and Twitter @JudithArnopp. Making decisions is not one of Francesca Milliardo's strengths so when something mysterious starts unfolding in her father's mansion in Milan - it's no surprise that she's unsure what to do. Francesca dreams of becoming a star in the contemporary art world and she has all the right connections, though what should be a summer of fun is turning out to be anything but. My career is a cocktail of art and fiction. No – I don’t swan about London in high-heels with a Manhattan in my hand looking at Old Master paintings (though that sounds fun...) but alongside my writing, I run a sculptural restoration business specialising in public sculpture. These may seem dichotomous ways of earning a living, but they blend surprisingly well to make for a colourful life. My work on statuary is primarily outdoors and highly practical. 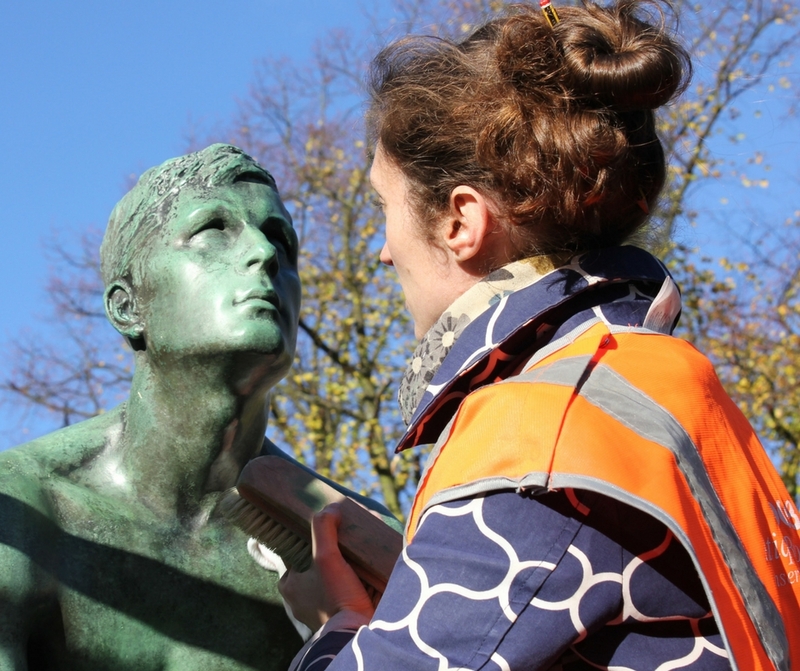 I work on War Memorials, large-scale monuments like Nelson’s Column and contemporary sculpture. In the UK, we don’t realise how lucky we are to have art on our streets that people pay significant sums to see in art galleries: Henry Moore, Rodin, Hepworth and these masterpieces have a pretty hard life what with the harsh urban environment, vandalism and pigeons. Occasionally, I come across a sculpture that makes my heart thrum and in the case of my most recent book, Girl In A Golden Cage, a book was born out of the encounter. This novel, a mystery set in Milan, is about Francesca Milliardo who is the daughter of a wealthy businessman. Francesca is set on becoming a contemporary artist, but strange events are playing out in her own home and getting in the way. The statue that inspired the story is by Anthony Gormley, artist of the iconic Angel of the North sculpture in the UK. His sculpture, Feeling Material XIV is much smaller than its titanic brother, but no less impactful. In the novel, I made it part of her father’s art collection and it represents the supernatural theme that threads its way through the story. My last novel, A Rarer Gift Than Gold, was a conspiracy theory set in the art and craft world. 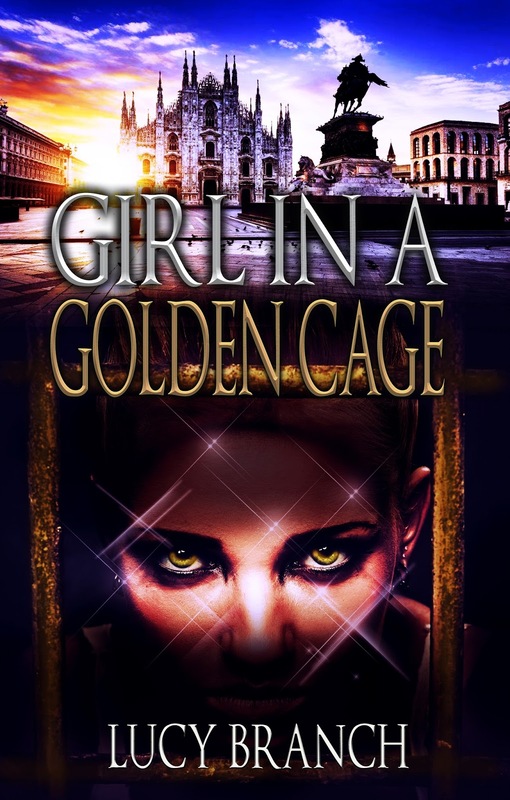 Girl In A Golden Cage sees some characters from the first story feature, but it is a standalone novel with a new main character and her own challenges. I think this is where I can offer my readers something unique. My in-depth knowledge of the art world means that I can open up my specialism to them and as my field is so unusual, it’s unlikely they will have come across it before in fiction. Milan was an obvious choice as a setting for the new book. Not only is it Italy’s business capital which is relevant to the plot, art lovers get the extra bonus of scenes carried out in breathtaking locations such as beneath incredible architecture like The Duomo and cutting edge contemporary art venues like Hangar Bicocca. Art, mystery, Milan, paranormal, romance - it’s a potent blend for fans of Dan Brown, Kate Mosse and Scott Mariani. Lucy Branch lives in North London with her husband and three children. She is a lover of Tolkien above all things, but a close second comes Italy. When not penning fiction or treating a statue, she enjoys sewing though she confesses to being truly horrible at it. Find our more at Lucy's website www.lucybranch.com and find her on Facebook and Twitter @lucybranch11. Jasper Tudor, son of Queen Catherine and her second husband, Owen Tudor, has grown up far from the intrigue of the royal court. But after he and his brother Edmund are summoned to London, their half-brother, King Henry VI, takes a keen interest in their future. Bestowing Earldoms on them both, Henry also gives them the wardship of the young heiress Margaret Beaufort. Although she is still a child, Jasper becomes devoted to her and is devastated when Henry arranges her betrothal to Edmund. He seeks solace in his estates and in the arms of Jane Hywel, a young Welsh woman who offers him something more meaningful than a dynastic marriage. But passion turns to jeopardy for them both as the Wars of the Roses wreak havoc on the realm. Loyal brother to a fragile king and his domineering queen, Marguerite of Anjou, Jasper must draw on all his guile and courage to preserve their throne and the Tudor destiny. Joanna Hickson spent twenty five years presenting and producing News and Arts programmes for the BBC. 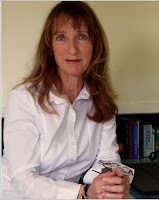 Her first published book was a children’s historical novel Rebellion at Orford Castle but more recently she has turned to adult fiction, concentrating on bringing fifteenth century English history and some of its fascinating principal characters to life. She is married with a large family and gets inspiration from her Wiltshire farmhouse home, which dates back to her chosen period. Find Joanna on Facebook and Twitter @joannahickson. War is coming to Saxon Briton. As one kingdom after another falls to the savage might of the High King, Cerdic of Wessex, only one family dares to stand up to him — The Du Lacs. Budic and Alden Du Lac are barely speaking to each other, and Merton is a mercenary, fighting for the highest bidder. If Wessex hears of the brothers’ discord, then all is lost. 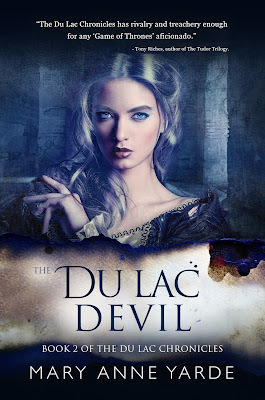 Fate brings Merton du Lac back to the ancestral lands of his forefathers, and he finds his country on the brink of civil war. But there is worse to come, for his father’s old enemy has infiltrated the court of Benwick. Now, more than ever, the Du Lacs must come together to save the kingdom and themselves. Can old rivalries and resentments be overcome in time to stop a war? sings a song of friendship and life. I started writing Falling Pomegranate Seeds: The Duty of Daughters not long after the publication of my first novel, Dear Heart, How Like You This? That novel depicted my imagined reconstruction of Anne Boleyn’s life as seen through the eyes of a man always loving her. Like my character, Sir Thomas Wyatt, I believe with all my heart that Anne Boleyn’s death was unjust, and an act of deadly Tudor politics. I see her death as murder, and one of the many things Henry VIII has to answer for. Researching Dear Heart also made me aware of his appalling and heartless treatment of his first wife, Katherine of Aragon and their daughter Mary. By the time I had completed my first novel, I found myself so drawn to Katherine’s story that I decided it had to be my next major work. 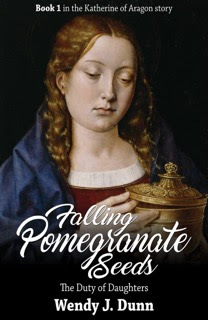 Falling Pomegranate Seeds: The Duty of Daughters focuses on Catalina’s childhood and early teenage years in Castile. My first attempt to write this work was from the point of view of Maria de Salinas. But I had to rethink that when I realised my efforts to give voice to a child and young girl, who was recounting what really was an adult story, just didn’t hit the bullseye. Despite the encouragement of receiving a short listing in the HarperCollins Varuna Awards for Manuscript Development, it was a different story when my agent sent my work to publishers. Their feedback forced me to face the fact that I needed to dismantle years of work and retell my story through one of my adult characters. Deciding on that character was easy. Constructing and peopling Catalina’s world had made me grow to love Beatriz Galindo. Beatriz Galindo – a respected scholar who lectured at the University of Salamacha and became a tutor to Queen Isabel, before tutoring her children - aroused in me those very important ‘what if’ questions essential for a writer of fiction. She was also a person I felt deserved to be brought to life on the page. What was not easy was tackling a rewrite. A new main character meant rebuilding my novel through the story of that character. Grieving about putting aside my first vision for this work, I decided it was easier to turn my attention to another project inspired by Dear Heart; revisiting the last days of Anne Boleyn through the eyes of her niece, Kate Carey, in The Light in the Labyrinth. I always planned to return to Falling Pomegranate Seeds. I believed in the work and I had done all the research needed to achieve the first version of the first part of Katherine of Aragon’s story. I had even gone to Spain to walk in Catalina’s footsteps. The Light in the Labyrinth was published in 2014, and I started researching another book project. I told myself I was waiting for the right time to get back to Falling Pomegranate Seeds. That day came last year when I contacted Tim Ridgway of MadeGlobal Publishing about an entirely different matter. We exchanged a flurry of emails and Tim – likely trying to distract me in the kindest possible way from pursuing my original question – finally asked me if I had any other projects that may interest him. I told him about my planned novels about the life of Katherine of Aragon and how I had the rough draft of the first book, a work focusing on Catalina in her formative years. I gulped, and my mind quickly calculated the time I needed to rewrite a whole novel. “Four months,” I lied. Knowing I had a publisher interested in my work, I then had to work out strategies to turn that lie into truth. I booked myself into a writing retreat for two weeks in February 2016 and then worked towards that booking like a crazy woman…well, like a writer who knew they had an important, once in a lifetime deadline to meet. Tim received my manuscript on April 4th 2016, five months after our first email, and I received his offer to publish my work on the same day. Now that is a true moment for a writer to treasure – to get an acceptance for their work just hours after submitting it to a publisher. 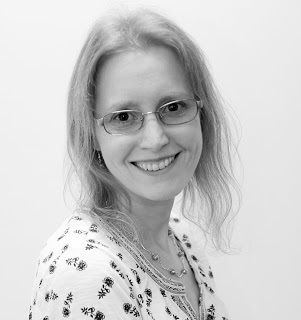 Wendy J. Dunn has been obsessed by Anne Boleyn and Tudor History since she was ten-years-old. 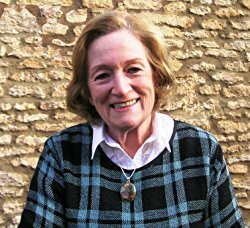 She is the author of three historical novels: Dear Heart, How Like You This?, the winner of the 2003 Glyph Fiction Award and 2004 runner up in the Eric Hoffer Award for Commercial Fiction, The Light in the Labyrinth, her first young adult novel, and Falling Pomegranate Seeds: The Duty of Daughters. While she continues to have a very close and spooky relationship with Sir Thomas Wyatt, the elder, serendipity of life now leaves her no longer wondering if she has been channelling Anne Boleyn and Sir Tom for years in her writing, but considering the possibility of ancestral memory. 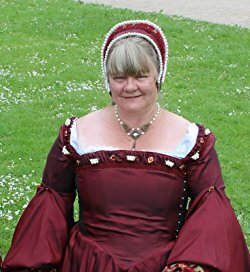 Her own family tree reveals the intriguing fact that her ancestors – possibly over three generations – had purchased land from both the Boleyn and Wyatt families to build up their own holdings. It seems very likely Wendy’s ancestors knew the Wyatts and Boleyns personally. Wendy gained her Doctorate of Philosophy (Writing) from Swinburne University in 2014, and is the Co-Editor in Chief of Backstory and Other Terrain, Swinburne University two new peer-reviewed writing journals. Find out more at Wendy's website http://www.wendyjdunn.com/ and find her on Facebook and Twitter: @wendyjdunn. Want to win a copy of Falling Pomegranate Seeds: The Duty of Daughters, by Wendy J. Dunn? To enter the prize draw, simply leave a comment below this post saying what historical figure you’d like to see Wendy write about next. Leave your comment by midnight on Saturday 17th December 2016. One winner will be chosen at random and contacted for their details. With each story my confidence grew, my love of writing increased, my voice strengthened. I was on safe ground, untouchable. But months of sitting and pondering eventually led me deeper, into the darkest corners of my own confession, and it was there that I needed to stay and face my confusion and shame. The writing process pushed me harder than anything else I’d ever done. I ached. I drowned – and stopped writing. I needed help. Insight came, as did the knowledge of the beauty and value of authenticity and vulnerability. 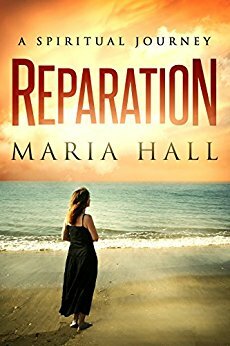 REPARATION – A Spiritual Journey is my story: from the sweeping coastline of New Zealand to the barren plains of Southern Spain, from youthful hope to deep despair, and from sin to reparation. As a free-spirited university student, living in New Zealand in the mid-seventies, my life had stretched before me like a wonderful adventure. I studied music, loved Jesus and entered the convent. Then, the unthinkable happened: a callous act resulted in an impossible choice that shaped the rest of my life. Heartbroken and in need of a miracle, I sought absolution as a Carmelite nun in the dark, silent cloisters of the Palmarian Catholic Church, one of the world’s most secretive and controversial religious orders, located in Seville, Spain. 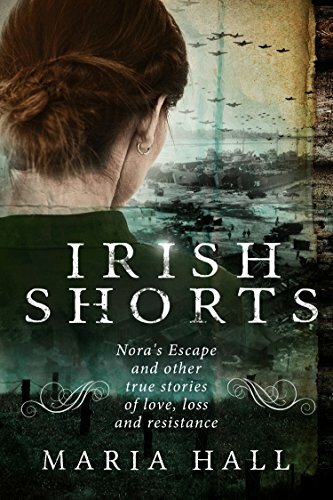 My second memoir is called IRISH SHORTS: Nora’s Escape and other true stories of love, loss and resistance. It is a small collection of six true stories from my Irish Catholic family caught in the iron grip of a changing world. I write about a young girl called Nora, my maternal grandmother, as she escapes her oppressive father to start life anew in the wilds of New Zealand. I tell of my family’s Christian values being tested upon discovering our home broken into, and the culprit lurking close by. The decades pass, and world wars turn into religious ones as I travel to bomb-blasted Belfast in search of my heritage and connection to one of Ireland’s most famous artists. But is our family hero the man we thought him to be? These are just some of the themes revealed, as I pick my way through family legend and fact to uncover tales of resistance, love and survival across three awe-inspiring generations. Maria Hall was born in Auckland, New Zealand. After leaving school, she completed a Bachelor of Music at Auckland University and a Diploma of Teaching, before studying Theology and Scripture at Chanel Institute (Auckland) and Yarra Theological College (Melbourne, Australia). She lives on the water’s edge on Auckland’s North Shore with her partner, Nicholas. She loves boats and all things Irish and Spanish. She is currently working on a second collection of short stories, as she continues to explore her family history and her love of memoir writing. Find out more at Maria's website www.mariahallwriter.com and find her on Facebook and Twitter @MariaHallWriter. 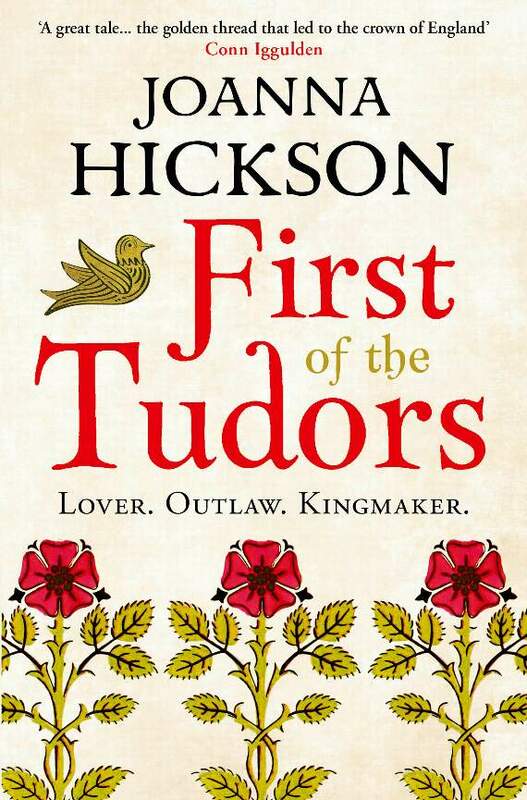 Anyone who enjoys historical fiction or history books about Tudor England will like this group. Whether you have been all the way to England just to tour the Tower of London or were just curious to learn more after reading "The Other Boleyn Girl", this group is for you! 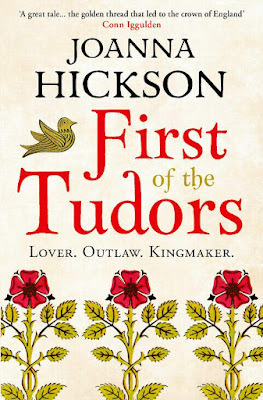 Share book reviews and ratings with Tudor History Lovers, and even join a book club on Goodreads. © Tony Riches 2011. Theme images by mammuth. Powered by Blogger.